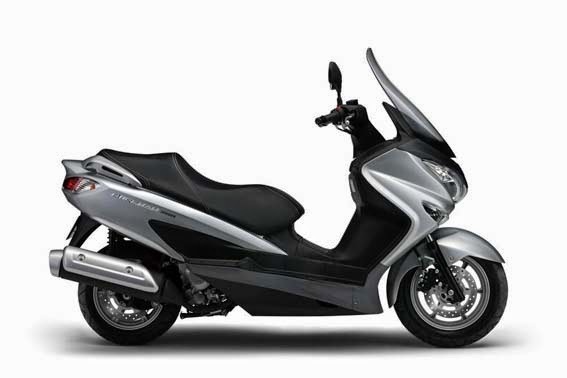 2014 Suzuki Burgman 200 ABS Features, Specs and Price - Utilizing Suzuki's most advanced technology the New Suzuki Burgman 200 ABS has got everything you need and more. The plush double stitched seating and specially designed cutaway floorboards provide a comfortable riding experience that is second to none. From the sleek elegant body styling to the powerful 200cc SOHC engine the Burgman 200 ABS offers best riding experience possible. Whether you are touring the town or commuting to work the Burgman 200 ABS is just what you need to get the job done with style and class. Price Suzuki Burman 200 ABS be priced $ 4,999. The Bugman 200’s ABS* monitors wheel speed and matches stopping power to available traction. *Please note that ABS is a supplemental device for brake operation, not a device for shortening stopping distance. Always remember to reduce speed sufficiently before approaching curves and corners. Spacious under-seat storage can hold two full-face helmets. A lightweight and compact 200cc engine produces strong low-to-mid range power and is powerful enough for freeway commutes. Suzuki fuel injection system achieves superb combustion efficiency, results in smooth engine start, improved fuel efficiency and smooth power delivery. The continuously variable transmission (CVT) incorporates a fixed-spring design that minimizes vibration. The telescopic front forks (33mm inner tube diameter) soak in harsh road bumps to provide a plush ride. Rear twin shock absorbers are equipped with spring pre-load adjustment. Rider can adjust the spring setting depending on the conditions. Center fuel tank layout and compact engine design creates a low-center of gravity which contributes to great stability and maneuverability. Ergonomically designed for an easy foot reach from the ground. The ergonomically designed and wind-tunnel tested windscreen provides excellent wind protection and reduces rider fatigue. 240mm front disc with 2-piston caliper and 240mm rear disc with single piston caliper provide efficient braking performance. The seat is shaped narrowly in the front while wider in the back for increased comfort. Conveniently placed grab bars for passengers. Two front storage compartments allow you to easily carry essential items on daily trips. An instrument cluster with turn signal, high-beam, FI, ABS, water temp, eco drive, clock, fuel, and more! Clean and classy cockpit displays provides an enjoyable riding experience. Warranty : 12 month unlimited mileage limited warranty.